We close out our 24 verses this year with the account of two people who watched and waited faithfully for the coming of the Messiah. Simeon had a short “bucket list” with only one item. He was an elderly man and had waited for many years to see the Messiah with his own eyes having heard from the Lord that he would not die until this had happened. He had probably counted Daniel’s seventy sevens and knew that the time was near (Daniel 9); if only he could stay alive a little longer. Anna was also one of the few who were watching and waiting. I hope you have had the privilege of knowing at least one crazy old person in your lifetime; and I mean crazy in a good way. One who has lived through enough hardship to really cherish the good times, with a frail body and a sharp mind that can give you that “look” that peers right into your soul. You’d be wise to listen when someone like that speaks to you. God gave Mary and Joseph a precious gift on that day they brought Jesus to be dedicated in the temple. I’m sure they felt alone and had many doubts. Was this little helpless baby really the Promised One? Yes, they took the angel’s message on faith but who else would believe? Mary and Joseph watched as their newborn son was taken up into Simeon’s arms. After he spoke his prophetic words and looked at them with those piercing eyes, they knew that they were not alone. 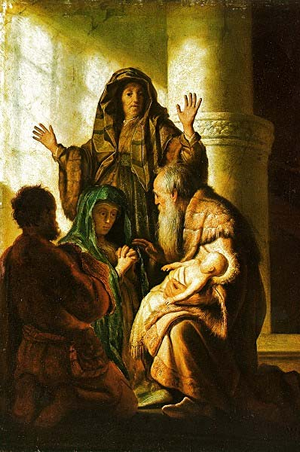 Simeon believed and confirmed everything they had heard from the Lord. Thank you so much for posting these Rick! They have been a real blessing.